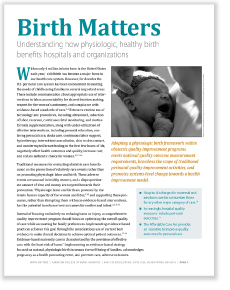 For hospital policymakers, payers and other organizations: Birth Matters is a 4-page handout for quality administrators that explains how implementing an evidence-based strategy focused on physiologic birth increases the well-being of families and prevents rare, adverse outcomes for hospital systems. Professionally printed copies of Birth Matters are available for purchase at ShopACNM. Birth Matters is a part of ACNM's Healthy Birth Initiative. Click here to learn more.